Matthew Spitzmueller, assistant professor in the School of Social Work in Falk College, has been selected to participate in one of the Robert Wood Johnson Foundation’s (RWJF) leadership development programs designed to equip leaders across the country—in every sector and field—to collaborate, break down silos, and use their influence to make communities healthier and more equitable. 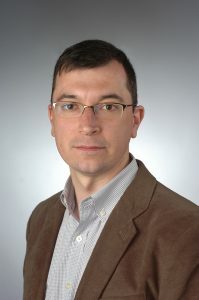 Spitzmueller’s study is titled, “Upstate New York – Unfamiliar Territory: Evaluating the Impact of Health Care Reforms on Behavioral Health Care Providers in Rural Upstate New York.” This project will explore the opportunities and barriers rural behavioral health organizations experience as they implement health care payment and delivery reform. According to Spitzmueller, “rural behavioral health services target a population that is uniquely vulnerable, costly to serve, and difficult to reach. When behavioral health systems do not effectively engage this population, health disparities worsen and untreated illnesses put added pressure on high-cost systems, such as hospitals.” This study will focus on ensuring that rural behavioral health providers can survive and flourish in a changing health care system, which is critical to building equitable and sustainable systems of care. “The findings from this project will be used by behavioral health and social service organization leaders in rural areas of New York as well as county and state government officials to continuously improve the behavioral health service system,” says Spitzmueller. Specifically, Spitzmueller was selected for the Interdisciplinary Research Leaders program. Designed for teams of two researchers and one community leader, Interdisciplinary Research Leaders supports engaged research, crafted and conducted by innovative teams to explore a problem and apply a solution in real time, making an immediate positive impact in their home communities. The three-year program provides participants with annual support of up to $25,000 and a one-time research grant of up to $125,000 per team. This study fits Spitzmueller’s background and trajectory as an ethnographic researcher of mental health policy and organizational practice. Spitzmueller earned his Ph.D. from the University of Chicago’s School of Social Service Administration. His research examines direct service provision to adults with severe and persistent mental illness, the strategies behavioral health workers adopt as they negotiate changing work conditions under Medicaid reform, and the impact of policy reform on socially and economically vulnerable people. As a participant in the RWJF leadership program, Spitzmueller will benefit from high-caliber curricula and coaching from national leaders, collaborate with other cutting-edge thinkers to create greater impact, and accelerate his ability to build healthy communities, inform public opinion and policy, and contribute significantly to building a Culture of Health. To learn more about Interdisciplinary Research Leaders and RWJF’s other leadership development programs, visit the IRL website. The Robert Wood Johnson Foundation is the nation’s largest philanthropy dedicated solely to health. Since 1972, it has supported research and programs targeting some of the nation’s most pressing health issues, from substance abuse to improving access to quality care.